Nestled into the end of a cul de sac - your paradise awaits. 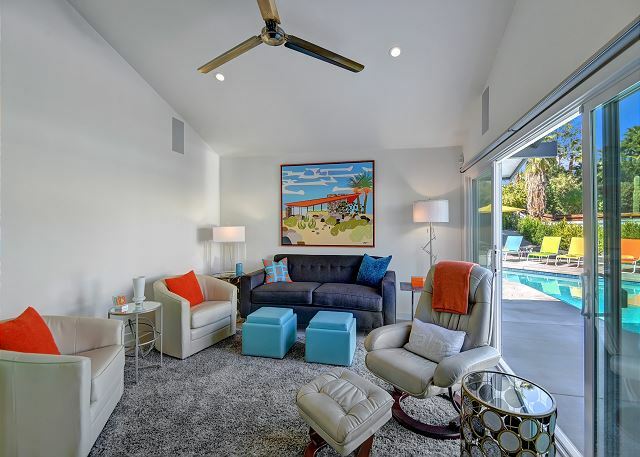 DESERT GEM just finished a complete remodel and redesign with brand new furnishings, commissioned art pieces and a new pool/spa. 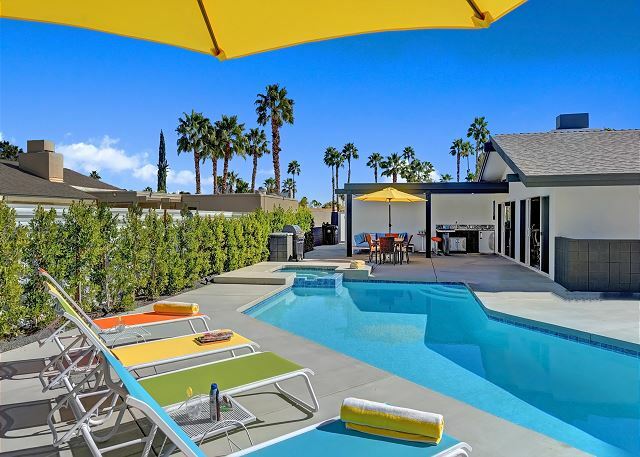 This home has 2 bedrooms and 2 bathrooms with wide open walls of glass to the outdoor kitchen, pool and spa and colorful chaises lined with sunny yellow umbrellas and mountain views. 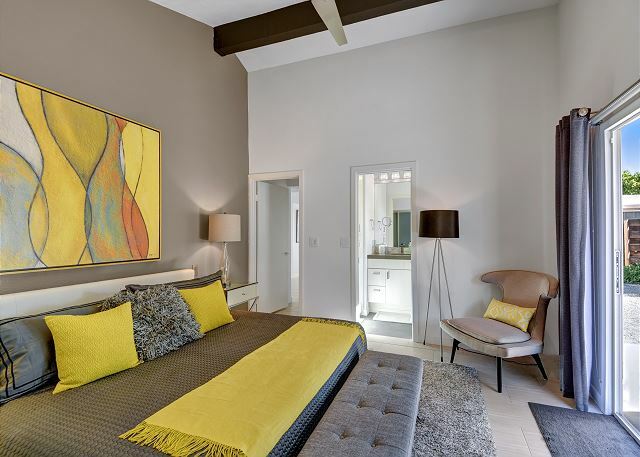 This pied-à-terre packs an energetic punch and is sure to please even the most seasoned traveler. 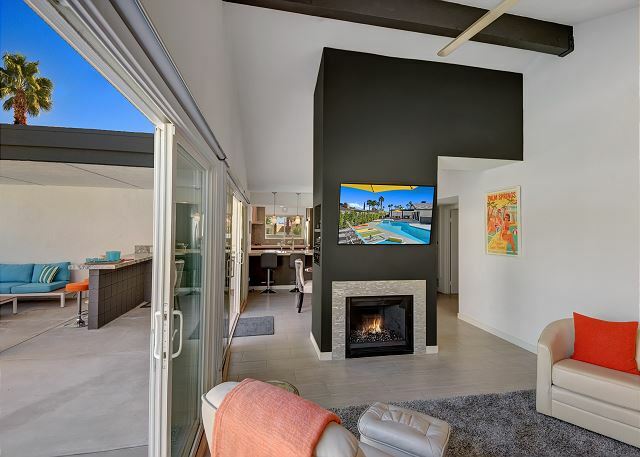 The living room with glass ‘fire and ice’ fireplace, 55" flatscreen tv with surround sound, and ample seating has full view and access to the pool yard as well as the covered outdoor kitchen, bar, and outdoor living room. 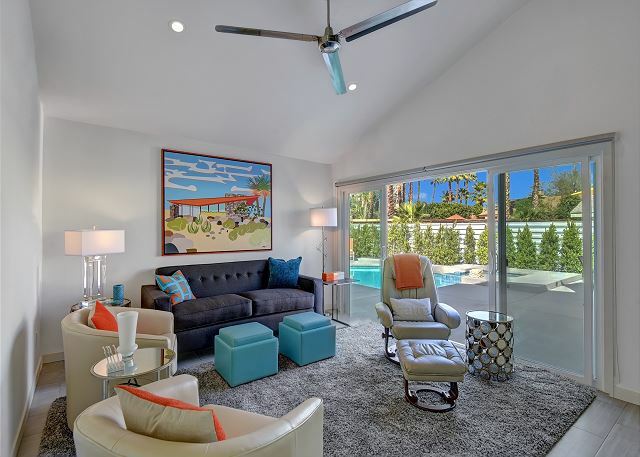 The tasteful yet bold design choices with lively colors make this home stand out from the crowd and will surely make a beautiful background for your Palm Springs vacation photos. The 14' wide x 22' foot long 5' deep pool has a 6' x 6' spa with 4 jets that sits above and cascades into the pool. 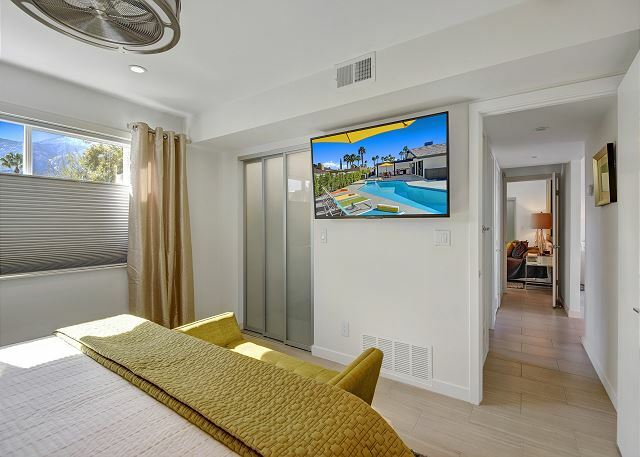 The master bedroom has a king bed, flatscreen 40" smart tv, and an en suite bathroom with glass surround "marble" tile shower and solid surface vanity with under mount sink. The master closet is built-in from end to end floor to ceiling. 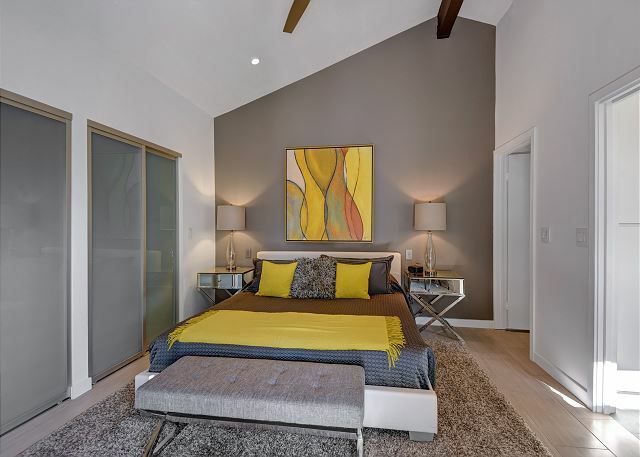 The guest bedroom has a king bed and a 55" flatscreen smart tv, and a small desk with a desk chair for those work emails or amazon shopping sprees. The guest bedroom closet is built-in from end to end floor to ceiling. 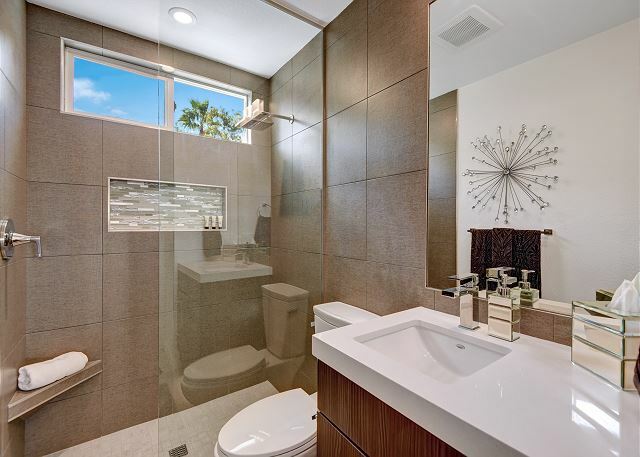 The hall guest bath has a glass surround tile shower and solid surface vanity with under mount sink. 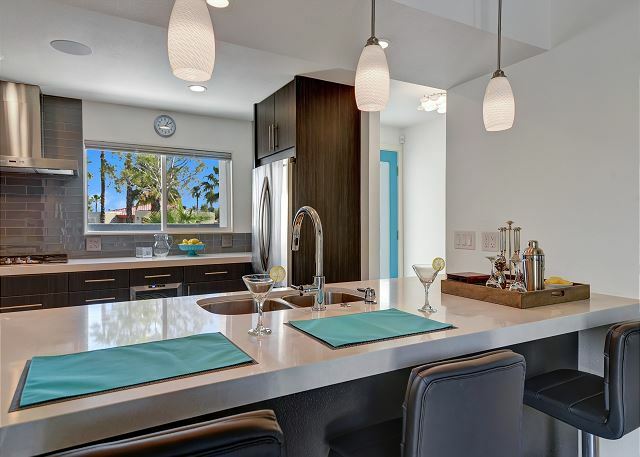 The kitchen with all new cabinets and dishware is the perfect place to whip up your gourmet specialties or shake up your craft cocktails and serve them from the bar out to the dining room. 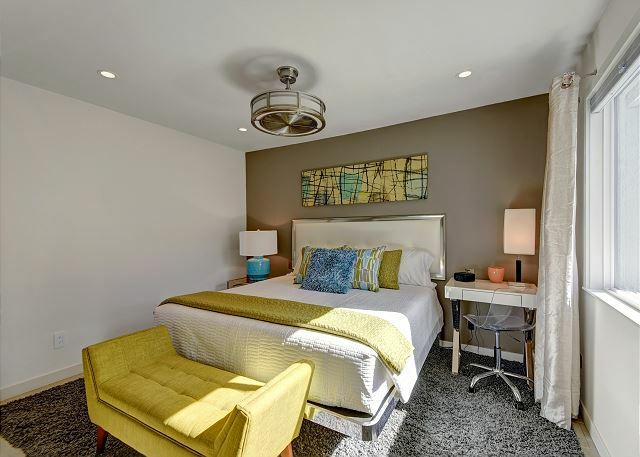 Both bedrooms and the kitchen have multiple outlets with USB plug ins to charge your tablets, smart phones, etc. Perfect for a single traveler or a small group/family. 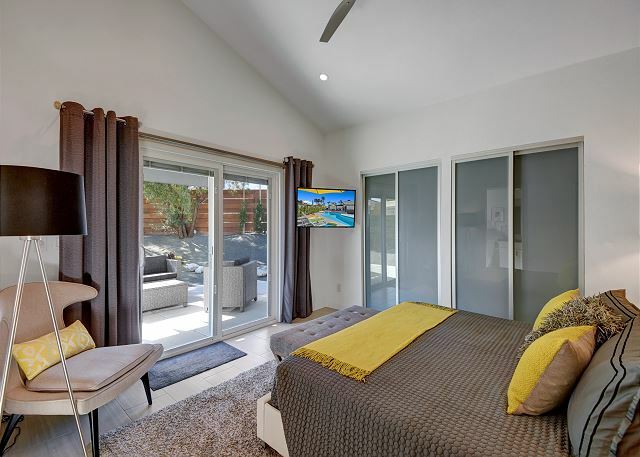 You could be one of the first people lucky enough to spend your vacation in the brand new DESERT GEM. THIS HOUSE REQUIRES BOTH A $750 REFUNDABLE DEPOSIT AND THE PURCHASE OF ADDITIONAL DAMAGE INSURANCE FOR $59. IF YOU DON'T WANT TO PURCHASE THE DAMAGE INSURANCE YOU CAN INSTEAD OPT FOR A $2250 REFUNDABLE DEPOSIT. Fantastic vacation rental, with all the amenities a person could ask for. Beautifully decorated and very comfortable. 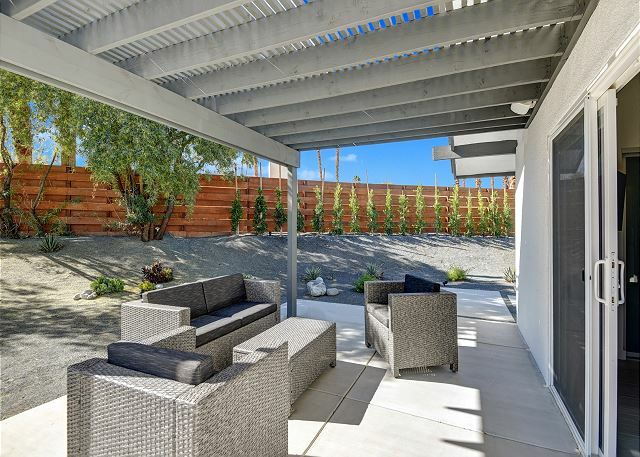 The outdoor spaces are perfect for a relaxing and luxurious stay. 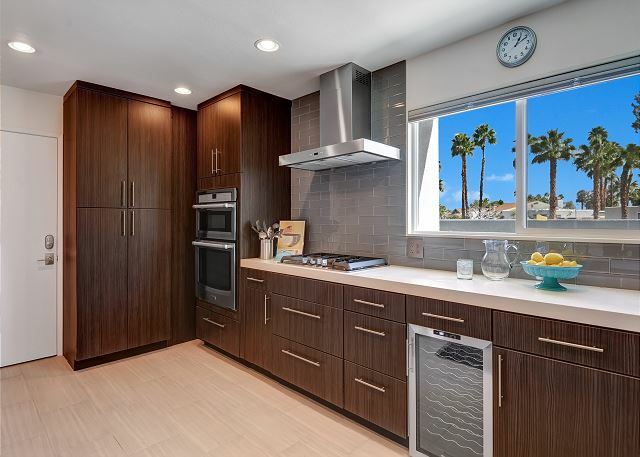 Very close to downtown and shopping. Great customer service. 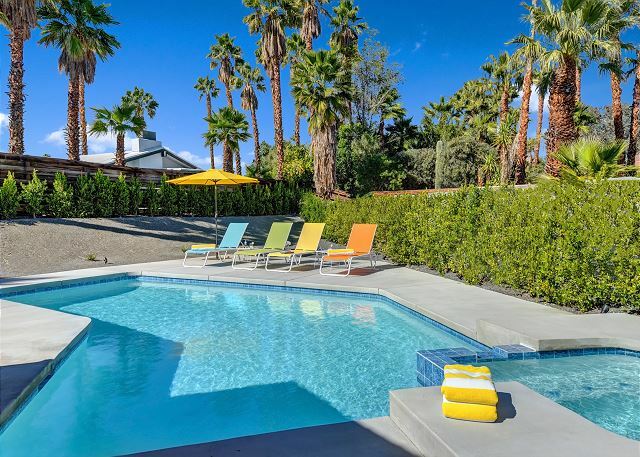 We enjoyed our stay at Desert Gem and will rent this house again. We did experience a couple of maintenance problems (HVAC & fire pit malfunctions) which the property managers worked hard to resolve, and they were nice enough to compensate us for the inconvenience....while it was inconvenient to have maintenance folks have to come, it did not really affect our overall experience. We loved the spa, BBQ every evening, nice view of the mountains, quiet neighborhood which convenient to stores, and comfortable beds. The house is very well appointed. We had a great time at Desert Gem! I've stayed in several HomeAway/VBRO locations over the last few years. This house was very nice in an easy to get to location. The beds were comfortable, the pool (and especially the hot tub) were also very nice. 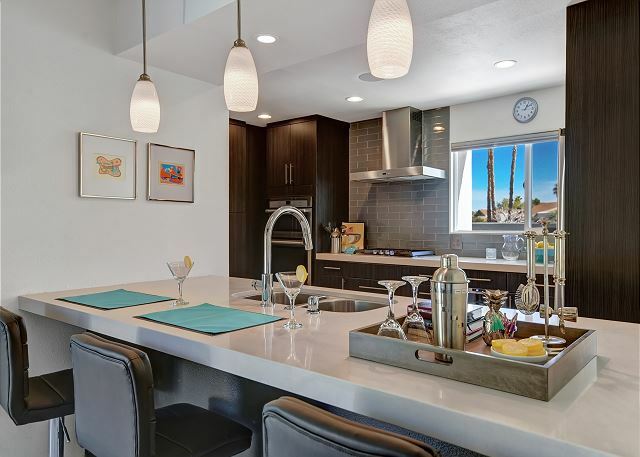 There is a well equipped kitchen, as well as an outdoor kitchen area for (QUIET) entertaining. The rental management company (Altamira) was OK. It all comes down to attention to detail, and it just felt like Altamira had a lot of house rules: especially for the departure checklist. Things like "if you use more than a couple towels per person, you should wash the towels. The Dishwasher should be run. Please use the dark towels to remove make-up or when using facial cleansers. All the rules on how to leave the house, but I still had to pay a $250 cleaning fee... If I have to do the laundry and the dishes, I'd think the cleaning fee could be a little less..
And then there was the issue with the coffee maker. It was old, very dirty in the reservoir,and there was a filter than was possibly never changed. When I notified them, to their credit, they came by that afternoon and brought a replacement (not new, but a replacement) coffee maker. But, this is where details matter... The old unit had a permanent filter. The new unit required a paper filter, and it was different shape from the old one. So, I had to go out and find the correct filters. Again, these aren't huge problems, and it wouldn't really stop me from renting from them again, but, these little details make the difference between an "ok" management company, and a great one. Paying a premium for a house should get premium service to match. Had a great time at the Desert Gem. Has all the amenities, is very clean, and property management is friendly and helpful. Would definitely recommend this spot. This house is perfect for a weekend getaway with the family. the house is really nice with lots of upgrades and the pool is very nice. We really enjoyed our time there. Really enjoyed my time at this spot. Great amenities and very well kept. Look forward to coming back again! The homes decor and design were great for my husband and I and our daughter and boyfriend. Super comfy beds . We wish there had been a few cleaning supplies , like a broom and dustpan and a few items in the kitchen ( salad tongs ) We had golf clubs and it was a bit cramped in the bedroom because the storage is limited since the garage is locked. These are small items and we really loved desert gem ! Planes fly right over the house but we didnt mind . House was immaculate and in a convenient location. Quiet and very private. Highly recommend. Was wonderful very quiet neighborhood my only warning is that the house is directly in path of the airport and planes fly constantly during the day. The house is exactly as pictured. We had a great stay at the Desert Gem. It was very clean and well maintained. The backyard was wonderful. Very private and the hot tub was amazing. The Property Management company was very responsive to our needs and very helpful. Highly recommend this place! The service we received from all Altamira's staff, and the property itself, exceeded our expectations and we would not hesitate to recommend anyone to stay here. The property is beautifully maintained and had everything we needed for our stay. 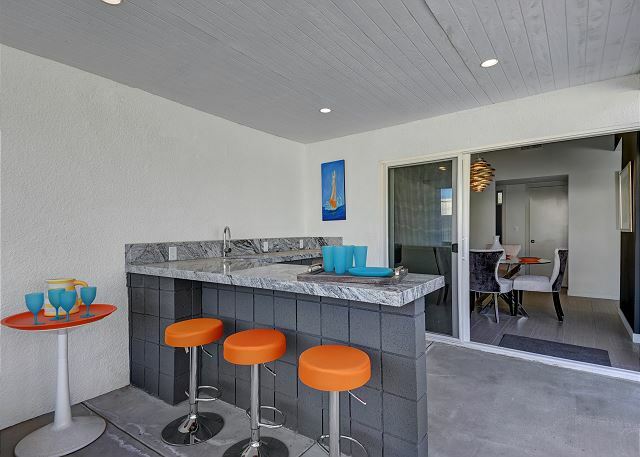 The location is peaceful and in easy reach (10 min drive) of downtown Palm Springs. This was the most beautiful and pleasant stay we ever had by far. We had an excellent stay at Desert Gem and would come back in a heartbeat. 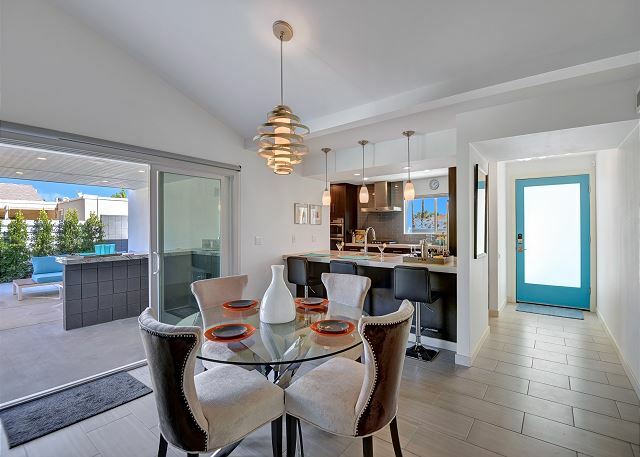 Clean and modern, and the perfect size for one family, or two couples, with everything you'll need to enjoy your time in Palm Springs. 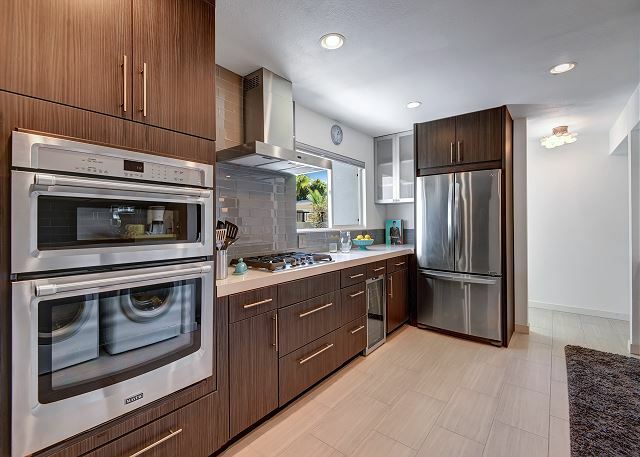 Altamira (property mgmt co) was friendly and responsive throughout the whole process, and even helped us out by arranging for a pack-n-play for our daughter to sleep in. 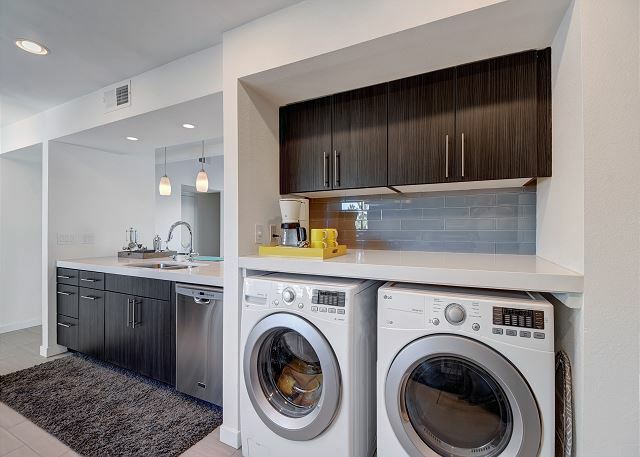 Kitchen was stocked with many essentials, and washer/dryer in the kitchen was so handy. Bedrooms were roomy and comfortable. 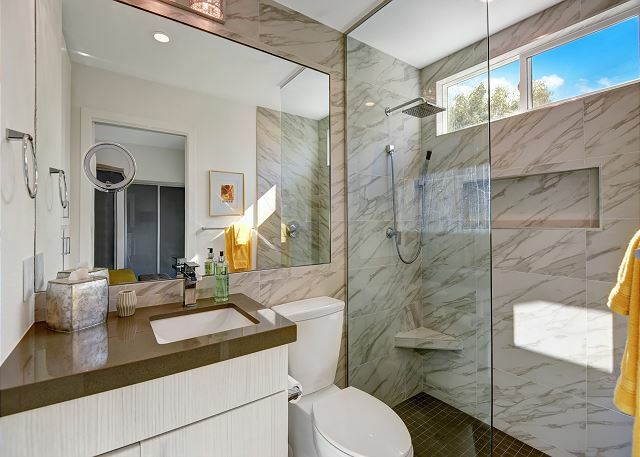 Bathrooms were modern, bright, and stocked with shampoo, soap, etc. Multimedia options (TV, blu-ray, Netflix, bluetooth stereo, surround sound) were great for lounging around the house in the evening. Power/USB outlets everywhere you'd need them. Location-wise, it's a 5 minute drive to the airport or downtown, 2 minutes from grocery stores/pharmacy/gas station, so it was perfect. 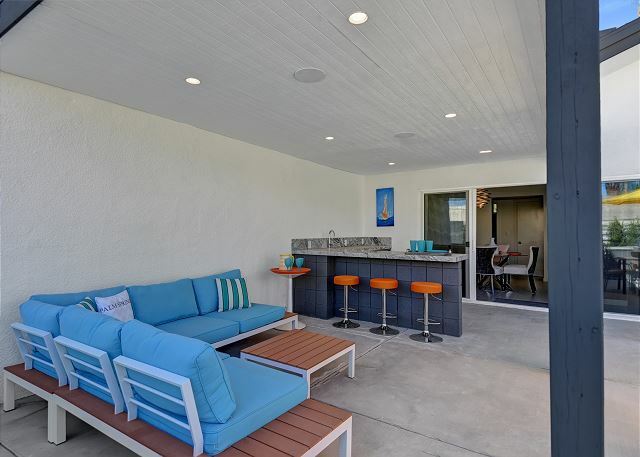 Pool area was great, with an outdoor fridge to store beverages for easy access. We didn't use the outdoor fireplace but wish we had! Covered patio was a huge bonus for getting out of the hot sun every so often. Easy controls for the pool lights and heater via a remote. As someone previously mentioned, this property is directly under the flight path from the airport, so most planes taking off fly directly overhead, which is a bit loud for 15 seconds or so each time. We actually didn't find this bothered us, but took a bit of getting used to. Our 2-year-old loved looking at the planes though, and it didn't affect our sleep or enjoyment inside the house. We did find one set of sheets was a bit scratchy, so we just changed them out for a spare set in the closet. A/C could have been a bit cooler (there were instructions not to adjust the thermostat), and getting hot water in the shower sometimes took a couple minutes, but these are all minor and wouldn't affect our decision to come back. Thanks, Altamira! Can't wait to come back! We loved this house. Very clean and quiet. The house is stocked with whatever one might need, down to notepads, rubber bands, all kinds of kitchen gear. Plenty of towels. Everything works. Very nice. 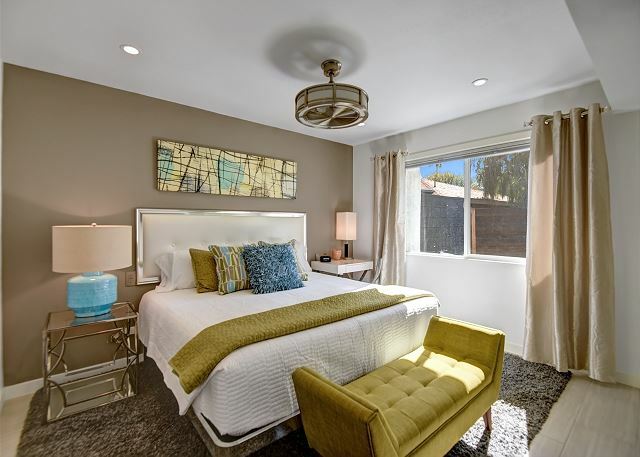 Our group was very happy with this property... Clean, nicely decorated, comfortable beds, TVs in each room with a great family room and kitchen area. The property managers took the time to meet us on the property to make sure it everything was fine. Great visit! Such a cute, luxurious house. My boyfriend and I love going to Palm Springs every chance we get. 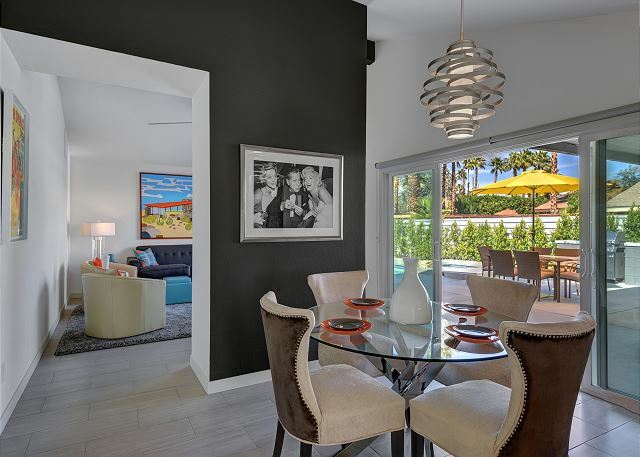 This was our second time staying in one of Altamira homes and they are just so fabulous. The home has everything you need! It makes it so easy to make yourself right at home. Beds are comfy, pool is great, house is in a great location. Will definitely be staying in this Gem again SOON!! I was very happy with this rental - had all of the amenities I wanted. Very well kept home and clean. Would highly recommend, and look forward to staying here again in the future. We had a wonderful and relaxing stay. Everything was perfectly maintained and perfectly clean. The home was well stocked with everything you need. Beautiful view of mountains from the backyard. This was one of the most beautiful and well appointed vacation homes we have stayed in. Everything was clean and no need to run out and buy the basics they were there for us if we needed them. The beds are extremely comfortable, rest and the pool were so welcoming after a long day at Coachella! Unfortunately we would not select this home as an option in the future due to the extreme noise ordinance rules. 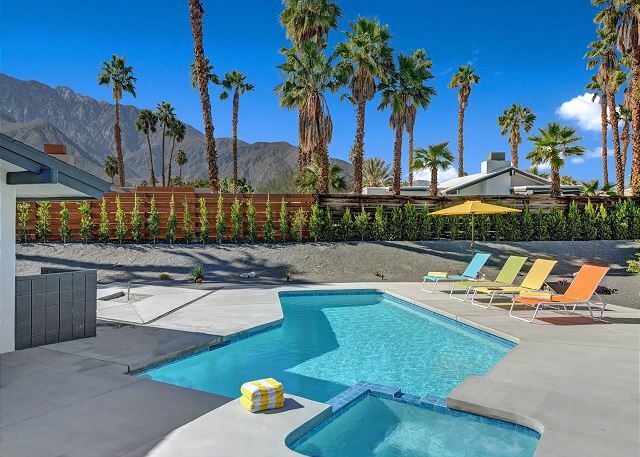 I have rented plenty of homes in Palm Springs and this was the first one to have so many threats if you too loud or played music....."absolutely NO music outside EVER" or if you break the rule and even have music on your phone you will be evicted and there will be a $1000 fine. Whew made us nervous to have music in the house. It would have been nice to sit by the pool and enjoy a little music. If you are NOT into relaxing by the pool/spa with music you must stay here is is almost perfect! I personally love a drink in my hand feet in the pool and Frank singing to me in the background but at Desert Gem you have to forget the Frank part.